This course is the first module of a two-part series. 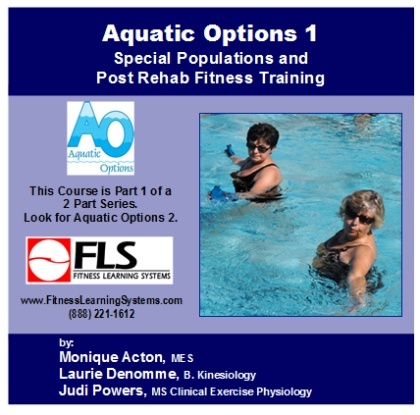 The information presented in this series is the resource material used in the Aquatic Options: Special Population & Post Rehab Fitness Training Certificate course. This course will review important fitness training guidelines and help you better understand how to integrate progressive aquatic fitness exercises for shoulder, knee and hip orthopedic considerations and low back pain. Learn and understand professional responsibilities associated with Standard of Care and Risk Management when working with special populations and post rehab clients. Identify exercise principles for cardiorespiratory, resistance, and flexibility training. Describe aquatic support stances for resistance and flexibility training. Understand the difference between open and closed chain exercises. Learn how to monitor intensity in the aquatic environment including an understanding of aquatic heart rate responses, objective and subjective measures of intensity, and the affects of medication on resting and exercise heart rates. Review shoulder, vertebral column, hip, and knee anatomy.